Modern Marshall tones that lean toward the classic JCM 800. Heavy overdrive and distortion that is rich in British character, feel, and attitude. A specially designed three band EQ allows you to sculpt it perfectly into any rig. The Angry Charlie has become a staple of the JHS line over the years. In the 3, we set out to keep everything that has made it a star in place while adding some tweaks for even greater flexibility and usability. The V3 is a force to be reckoned with in the high gain pedal territory. It convincingly and accurately breathes JCM800 tones with ease. Let’s look at the features. The Angry Charlie has five controls: Volume, Drive, Bass, Mids and Treble. The Volume control acts as a standard master volume control on an amplifier. Simply turn the control to the right and you are louder, turn it to the left and you are quieter. The Drive control decides the amount of overall dirt/overdrive that enters the signal path. Turn it up for more distortion and down for less. 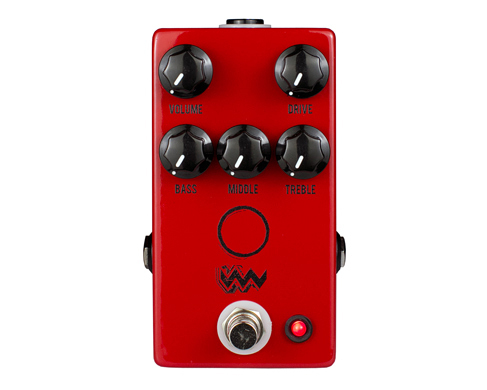 New to the V3 are the Bass, Mids, and Treble controls. To faithfully replicate a Marshall amplifier we felt it was time to incorporate a full Marshall-style tone stack. All three of these controls act as a cut and boost, while at noon they are relatively flat. The right 1/4″ jack is the input, and the left is the output.